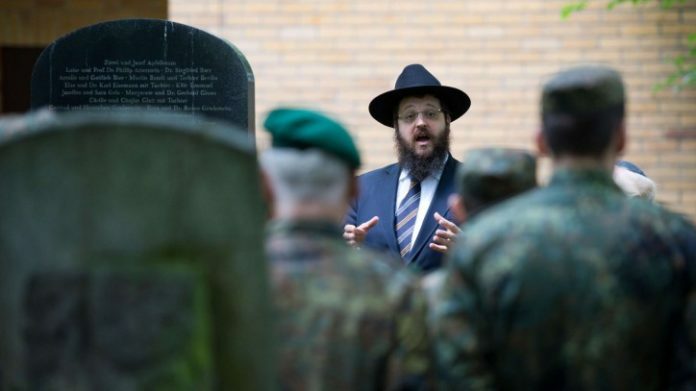 Berlin – For the first time in a century, Germany’s military will have rabbis as chaplains. Von der Leyen and Council President Josef Schuster are among those who will address a high-ranking conference that begins Wednesday on both the history of Jewish chaplains in the German military and the expectations of such a chaplain today. German soldiers are not required to identify their religion; the Defense Ministry estimates that about half have done so. According to the ministry, there are approximately 300 Jewish enlistees in addition to about 3,000 Muslims, 41,000 Catholics and 53,000 Protestants. Christian military chaplains were introduced to the Bundeswehr about 60 years ago. After World War II, Jewish military chaplains in Allied armies served in Displaced Persons camps and later served their own troops stationed in postwar West Germany. Some opened their military congregations to participation of Jews in Germany, even bringing back Reform Judaism — a movement with roots in Germany. After the unification of East and West Germany in 1990, many Allied troops left the country, and with them the Jewish chaplains. Now it will be the Bundeswehr itself that will introduce Jewish chaplains. And as part of NATO operations and peacekeeping missions, the military may call on the rabbis to travel to areas where German soldiers are stationed. According to news reports, the rabbinical candidates will have to undergo security clearance. No appointment date for the rabbinical chaplain has been given. There reportedly also will soon be imams appointed as military chaplains, although there will be no treaty with the Federal Republic of Germany, since instead of having a single representative body for Muslims in Germany, there are several.